ALEX UDOWENKO TTN Members of the Queer Student Union met yesterday, Feb. 13. QSU members remain hopeful that the survey’s results, to be released soon, will paint a better picture of the needs of GLBT students on Main Campus. 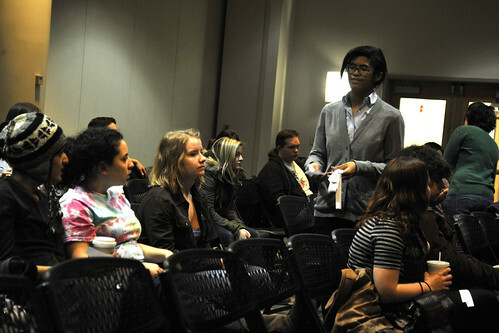 The results of a survey of the needs of GLBT students on campus will be known soon. The results of a survey addressing the needs of the GLBT community on Main Campus are expected to be released soon, more than a year after the assessment was announced. The survey was administered to students, staff and faculty during the course of the past year and its results aim to give administrators an idea of the GLBT climate on Main Campus. The questions asked in the survey ranged from the climate of the GLBT community to the effectiveness of outreach programs at the university, Dr. Scott Gratson, a GLBT advocate and director of the communications program, said. The survey was advertised on Temple’s website and through emails from President Ann Weaver Hart, but a large presence in pushing and advertising the survey came from GLBT organizations on Main Campus. Carter added that social media played a big part in pushing the survey and overall participation in the survey was very strong. The needs assessment was first discussed in Fall 2010, when Gratson and Hart met to discuss the needs of the community after a string of suicides by GLBT youth across the country. Gratson told The Temple News at the time of the announcement of the survey that it was put into motion after the theater department’s production of “The Laramie Project,” a performance about Matthew Shepard, whose 1998 death brought attention to hate crimes. Carter said she thinks the climate on Main Campus toward the GLBT community is tolerant, but added that the survey’s results should give a clear picture of what the community needs to do at Temple. “Even though there are organizations like Queer Student Union and Purple Circle, there’s not a significant amount of all the [GLBT] students on campus to make decisions on what we should do to change things on campus,” she added. Carter said that while she thinks there was strong participation in the survey, it could have been stronger with extra incentive for students to take it. When the results of the survey are announced, Carter said it will be used and studied by QSU.